The other night, at dinner, I listened to an animated discussion about bagels. People in NYC do not mess around when it comes to their bagels. They want them fresh, with just the right amount of chew, and a perfect crust. 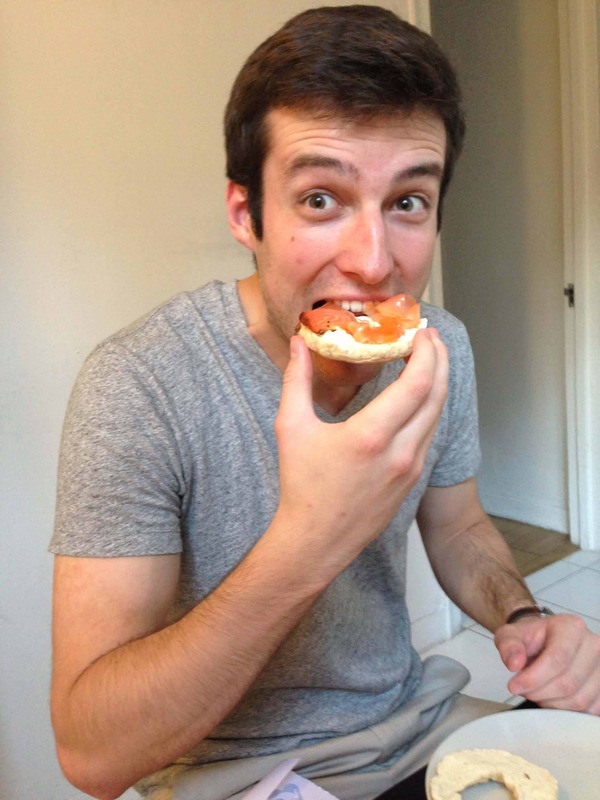 There is a belief that the water out here makes the bagels taste so good; but if you ask me, I’d say it’s the numerous old school, Jewish bagel shops that have perpetuated the tradition of making bagels the right way. 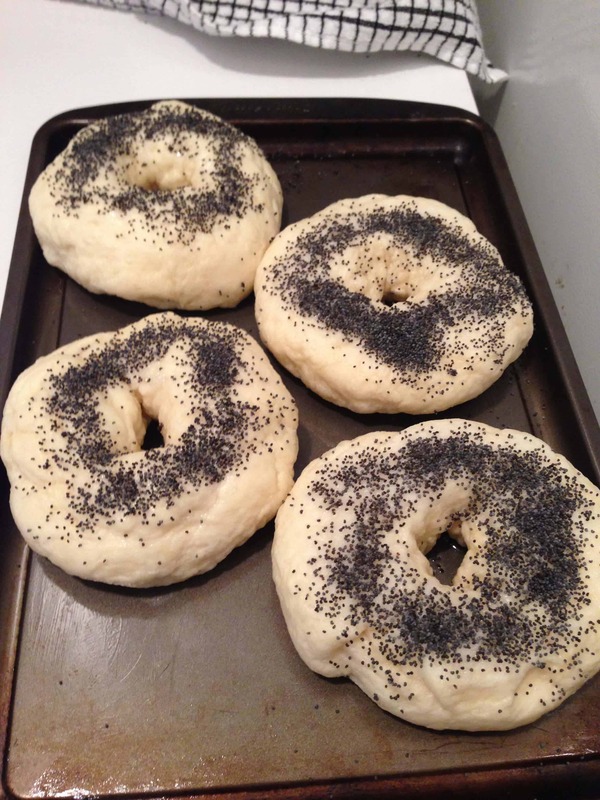 Regardless, I realized that it was time to try to make my own bagels (following this recipe). 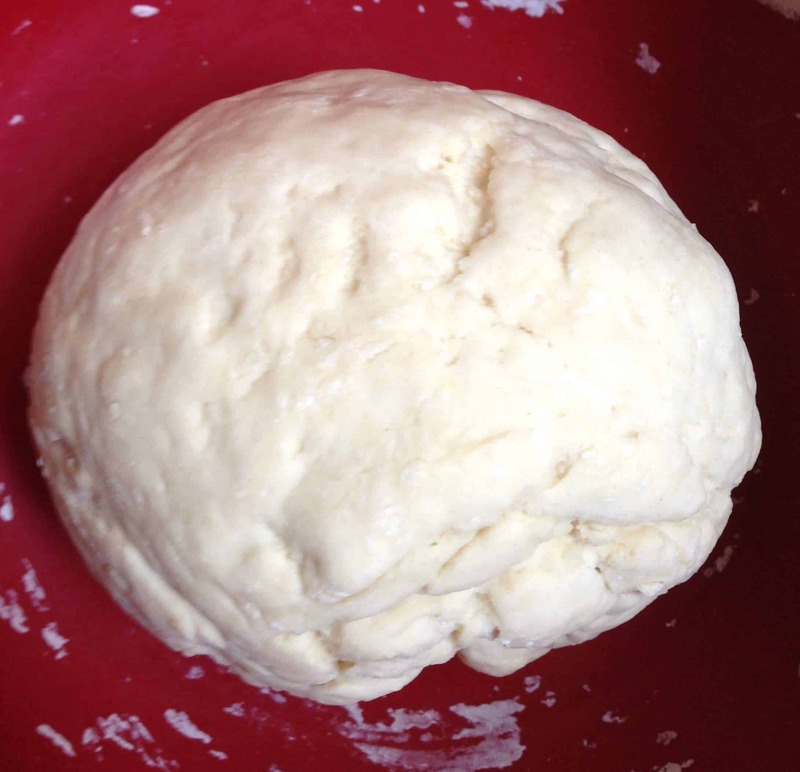 I made the dough this morning after a long training run (a 16 miler…ahhh!). Start by combining the water, sugar, and yeast together, and let the yeast develop for about 5 minutes. 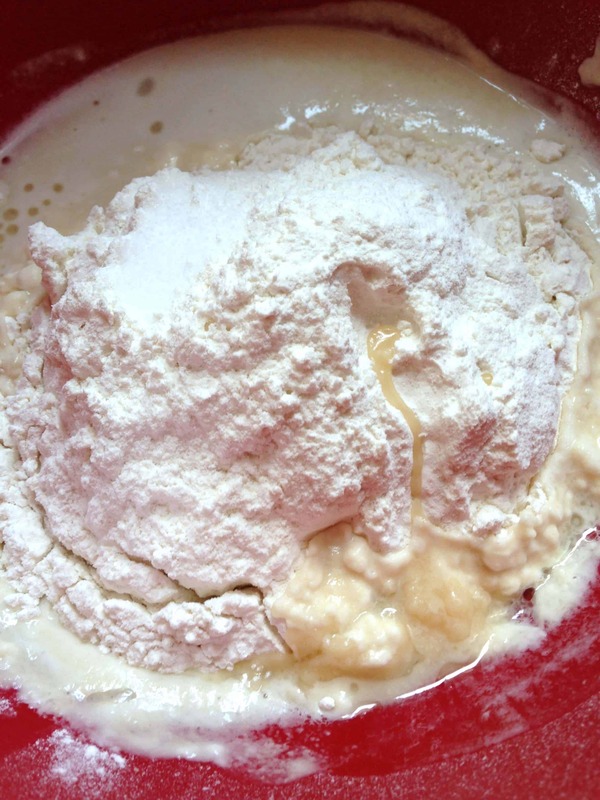 Add the flour, vegetable oil, malt syrup, and salt, and knead until the dough is elastic but firm (15 minutes by hand, 7 minutes with a dough hook). You may need to add in a bit of extra water or flour if the consistency of the dough is off, but do it little by little. 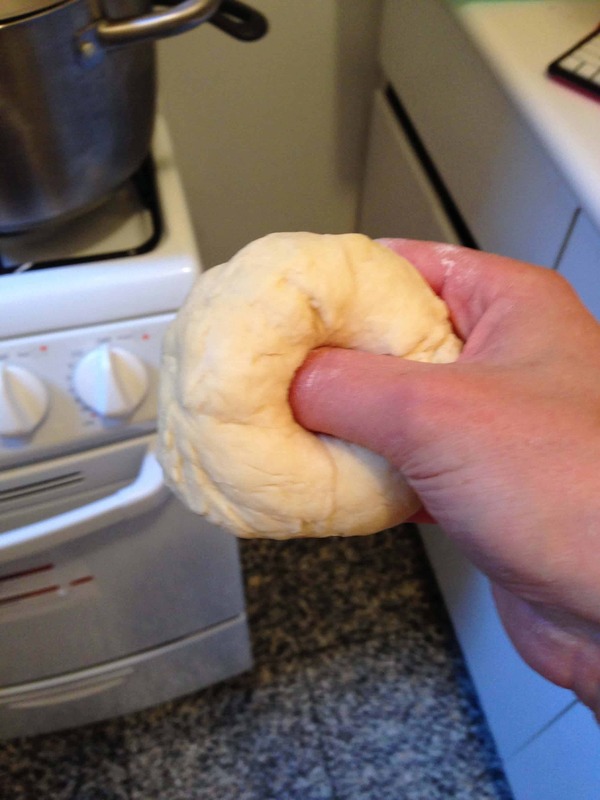 Let the dough sit and rise in a warm place until it has doubled in size. Turn the dough out onto a floured surface and knead again for a few minutes, before cutting it into 6 equal pieces. 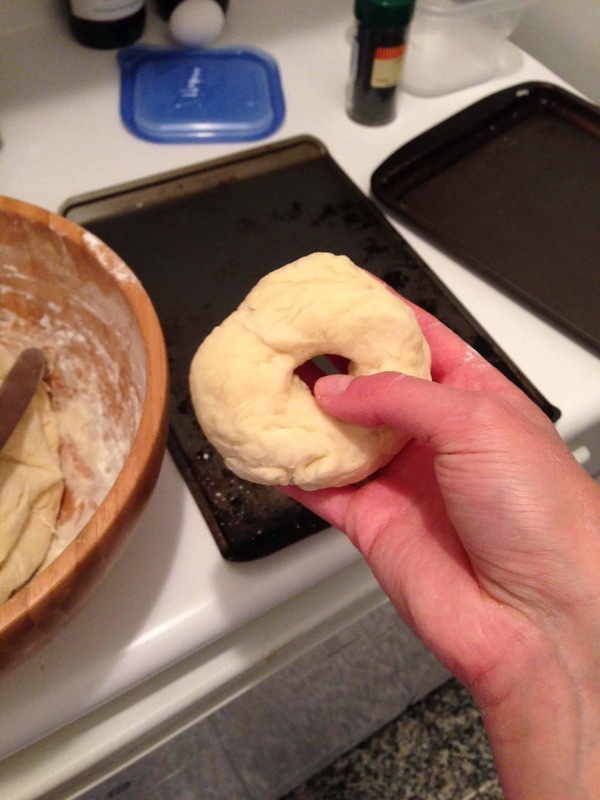 Roll each piece of dough into a smooth ball, and punch a hole in the center of each ball with your thumb. Stretch the ring out gently, until the hole is about 1.5 inches in diameter. 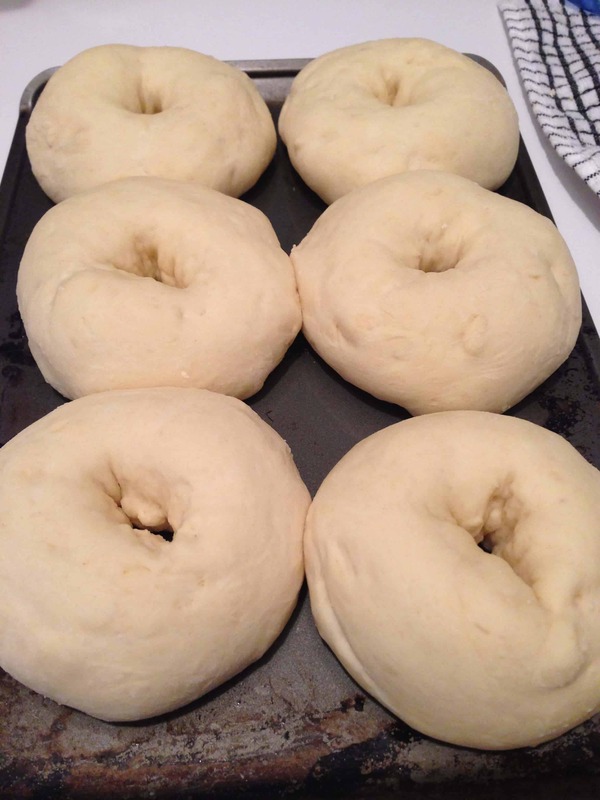 Let the bagels rise for another 30 minutes in a warm area. 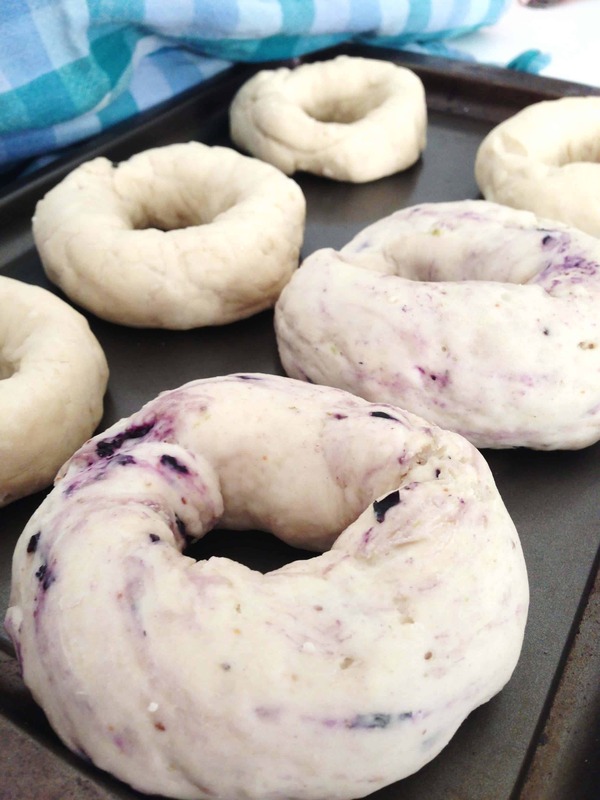 For the second batch of bagels I made, I added fresh blueberries and blueberry juice, and kneaded the dough for another five minutes, until the blueberries were well incorporated into the dough. Because of the juice and the blueberries, I had to add an additional cup of flour. After the second rising phase, bring 6 cups of water to a boil in a heavy-bottomed pot. 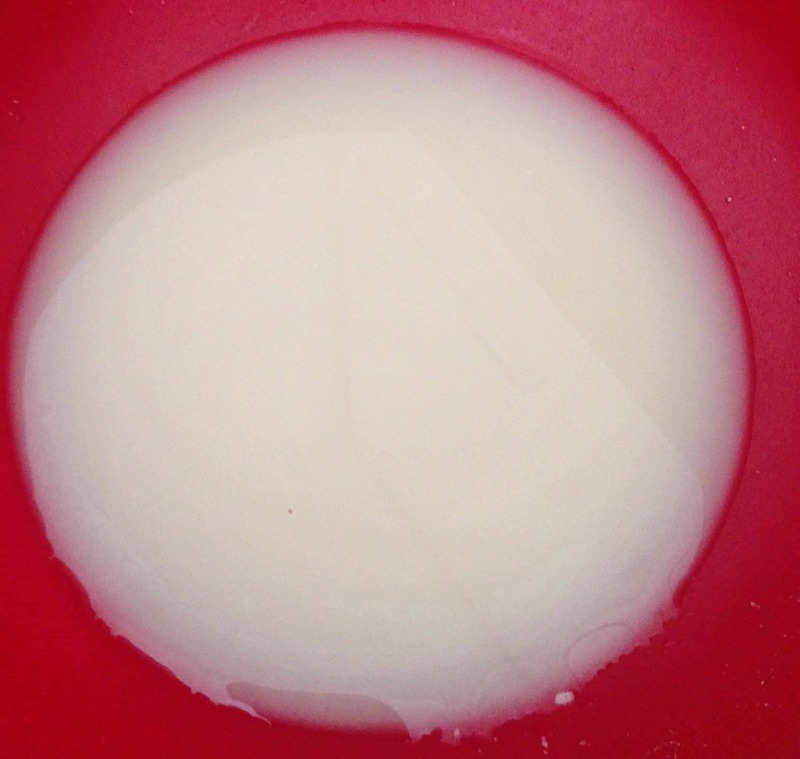 When the water was gently boiling, add a tablespoon of baking soda. 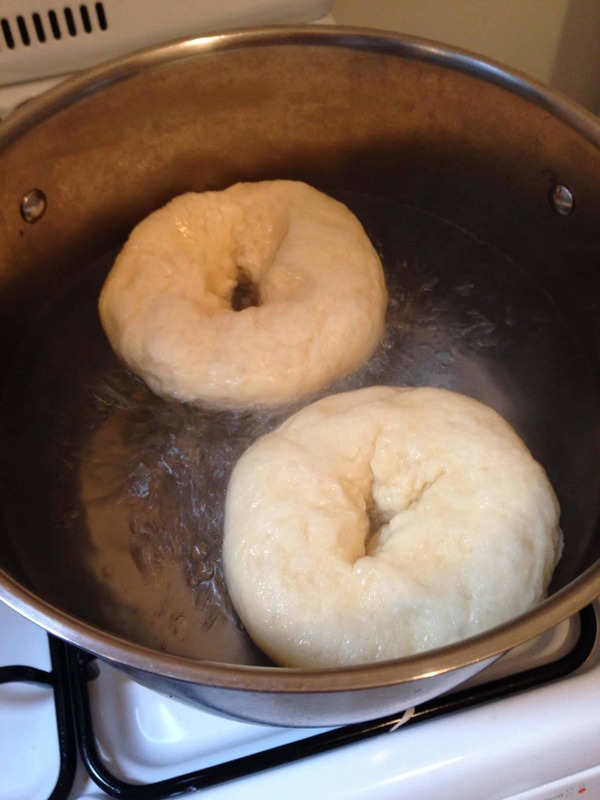 Place 2 bagels into the pot at a time, and let them cook for 45 seconds on each side. 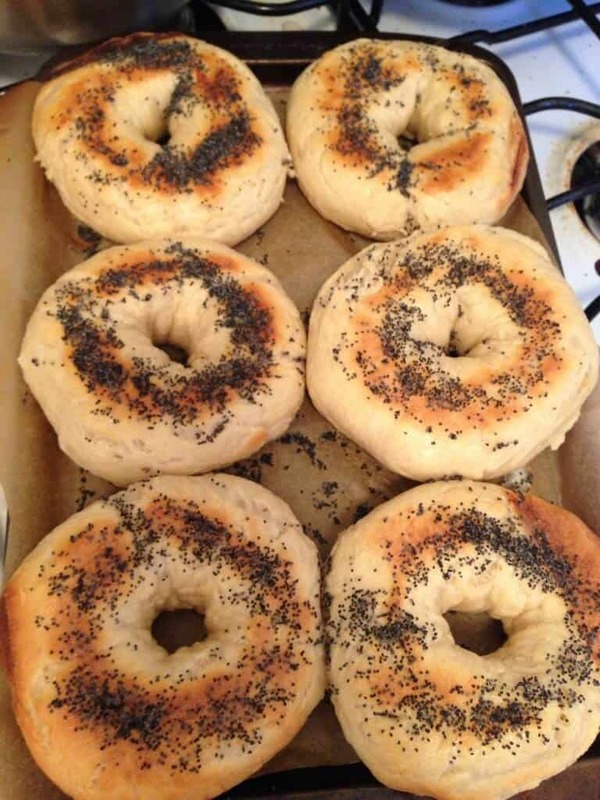 Once done boiling, remove the bagels and place them on paper towels (to take off excess moisture) before letting them cool on a baking sheet. Repeat these steps with the remaining bagels. 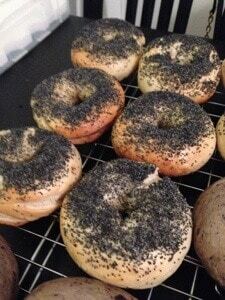 Brush the tops with egg wash and top them with poppy seeds. Bake them in the oven at 425ºF for 18 minutes (turning them over after 10 minutes). 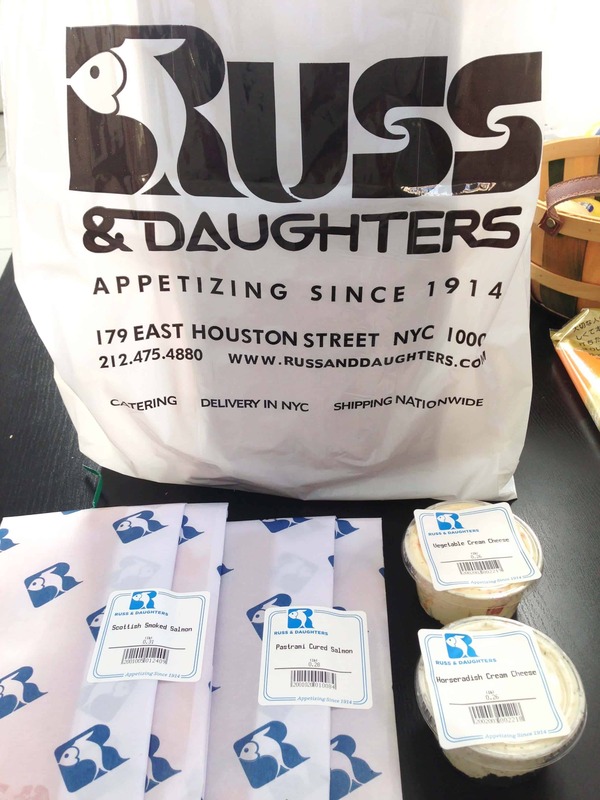 We took a trip down to Russ and Daughters (an AMAZING “Appetizing Store,” more of a deli really, on Houston) to get cream cheese and lox. 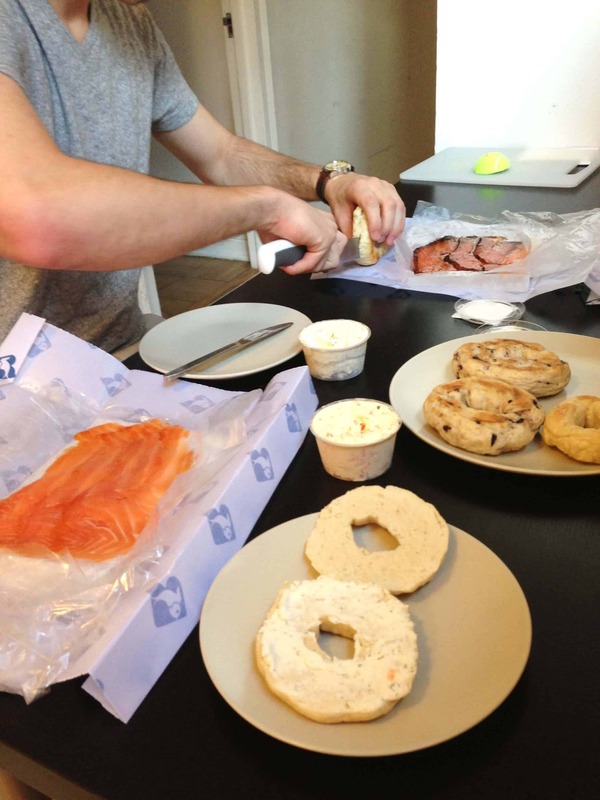 We decided on horseradish cream cheese, vegetable cream cheese, pastrami salmon, and Scottish lox. 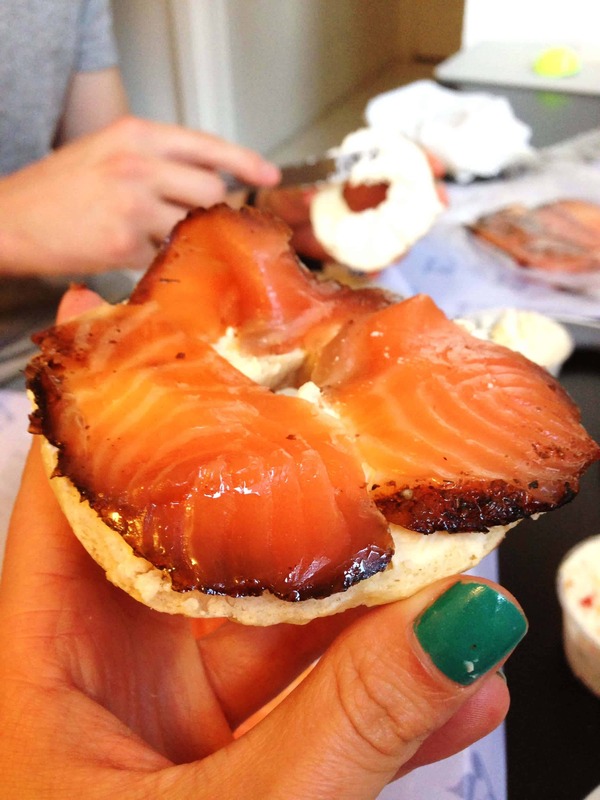 The fresh, warm bagels, with that delicious cream cheese and fresh lox was a winning combination. 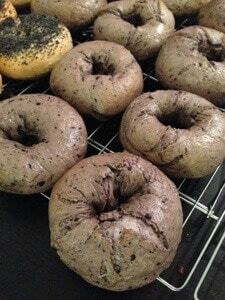 I can’t wait to try making new flavors…I’m thinking cinnamon sugar, multi-grain, and everything bagels. Where can one purchase malt syrup? Amazon is always a safe bet!! Why didn’t you use bread flour instead of all purpose flour? What texture does it take on when using all purpose flour? I can’t find blueberry juice – what can I use instead?